12th May 2012 (Düsseldorf, Germany): I am sitting at the airport and waiting for my flight to Jakarta. I feel the excitement running through my veins. A new culture is waiting for me: New people, food, religion, traditions and so on. Everything will be completely new. Will I find one's way in a country I don't know? Will the people like me? Will I get homesick? Too many questions. So I took a deep breath and entered the airplane. 24 hours later I arrived in Semarang. My first impressions are the heat, the huge number of motorcycles, different smells and the people who are watching at me. On the next day I visited SD Hj. Isriati for the first time. My heart was really touched how open the school welcomed me. After two days at school we started to Malang. This study trip was so much fun because I had the chance to meet the students and the teachers and to connect with them. I remember the frenzy of flashing cameras. The people were interested in me and wanted to take a picture with me. Sometimes so many pictures that my facial muscles felt tired. After three exciting days we drove back to Semarang and the real school work was waiting for me. At the beginning I was kind of nervous because I had no notion what would expect me. But Ms. Anik gave me perfect instructions and helped me every time in every situation. I met a lot of nice people and had so much fun with teachers like Mr. Izur or Mr. Zazin. I had also a wonderful host family. Mr. Sunoto and Ms. Titik welcomed me so warmly and showed me the javanese culture. I am so happy and thankful that we visited Borobodur, Yogya and Solo that words cannot describe it. Now are still 2 weeks remaining and I feel sad to say goodbye to the students and teachers. At Isriati I had the time of my life and I will always keep everyone in my heart. Do you know about the shadow puppets? 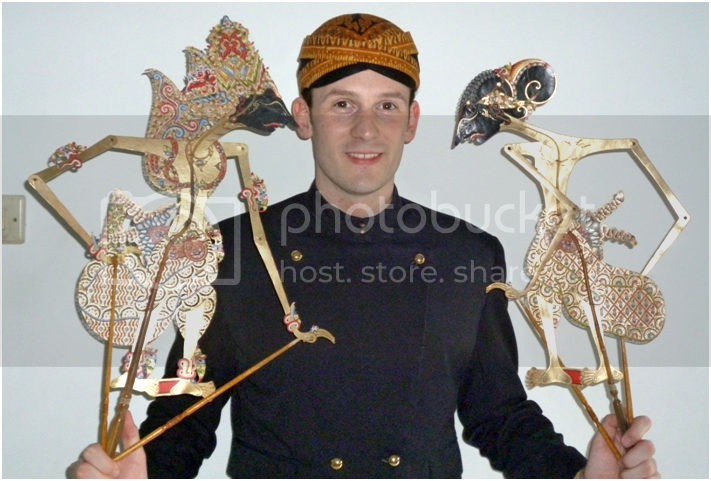 Shadow puppets is one of the Javanese culture and art. Of course you all know that. 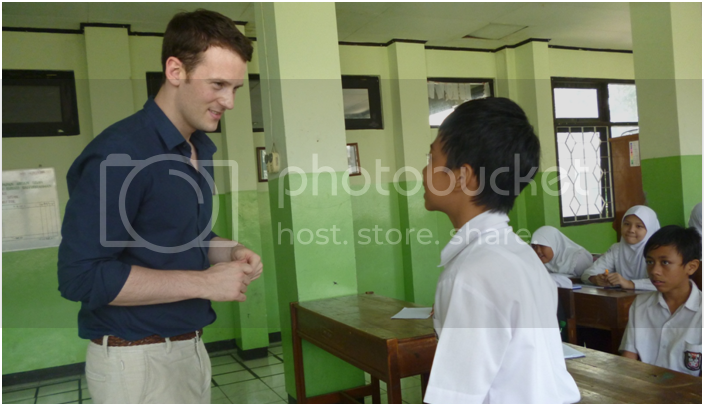 This time we see that our guest from Germany, Mr. Martin with a Javanese traditional dress holding shadow puppets. What do you think when you see that photo? Maybe it's strange picture for you. Why thus? It's because many javanese people don't know what is the beskap and the blangkon (male batik headdress), but now we can see a Germany person wearing the beskap and the blangkon. He is holding the shadow puppet. He looks like narrator and puppeteer of traditional shadow plays. And do you know about batik? Batik is one kind of special Indonesian clothe. Batik is very famous in the world. 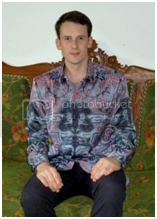 Now we can see Mr. Martin wearing the batik clothe. Although it's just the first experience but he feels comfortable with batik clothe. He looks very handsome with batik. How about you all? Do you like batik? Certainly all of you like and are rightfully proud of batik as inheritance of forefathers. So we should accustomely wear the batik in a vary occasion.